Recently I made an oversized pillow for my upcoming book, Christmas Figs, with the lovely ladies at FQS and I needed to quilt it. Well my long time friend and quilter, Diana, no longer lives right around the corner from my house so unless I wanted to ship the pillow to her in the Pacific Northwest, I needed to figure out a solution on my own. Plus there was that whole deadline thing happening too. So I had seen some "uneven" straight line quilting that I loved before, something about the lines the moment they became uneven, made the entire thing feel like hand quilting to me. I wasn't sure why it felt so different from regular straight line stitching but I absolutely loved the effect of it. I experimented with the method a little bit with some pillow props at the last Market and I was very happy with how they turned out so I decided that I was going to do my version of utility stitching or quilting on this book project. I made my zigzag stitch as long and as large as my machine would allow and I played around with the proportions a bit until I liked how the lines felt when they were next to each other. It took a few different experiments and had one that I liked and voila… Insta zig zag straight stitching that looks almost like large hand stitching when it is done. Seriously… I love how the finished look feels all vintage and slightly puckered and yet even all at the same time. Many of you wanted to know how I did it when I first showed this pillow on Instagram so hence this post. That is all there is to it. Aurifil ivory #2000 thread on the machine and in the bobbin. I seriously recommend that you try it! Time to Get Ready for the 12 DAYS OF CHRISTMAS SALE! 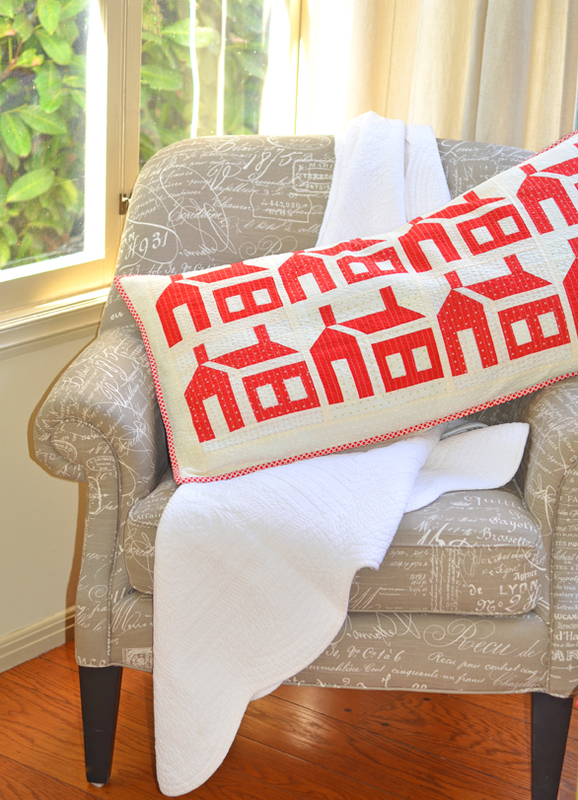 Love, love, love the pillow pattern and the quilting stitch. This is definitely on my 2018 must-do list… ???????? Beautiful! I use a three-step zigzag on my quilts a lot. It’s simple and charming. What does that mean “3-step zigzag”? Oh my goodness. 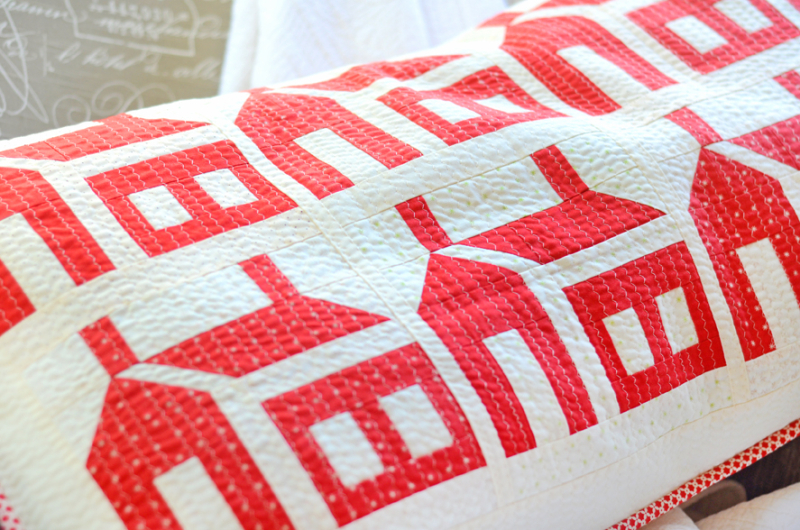 What a beautiful pillow and a very cool quilting idea! 3step zig zag is a stitch on sewing machine. My Viking Sapphire has this stitch. 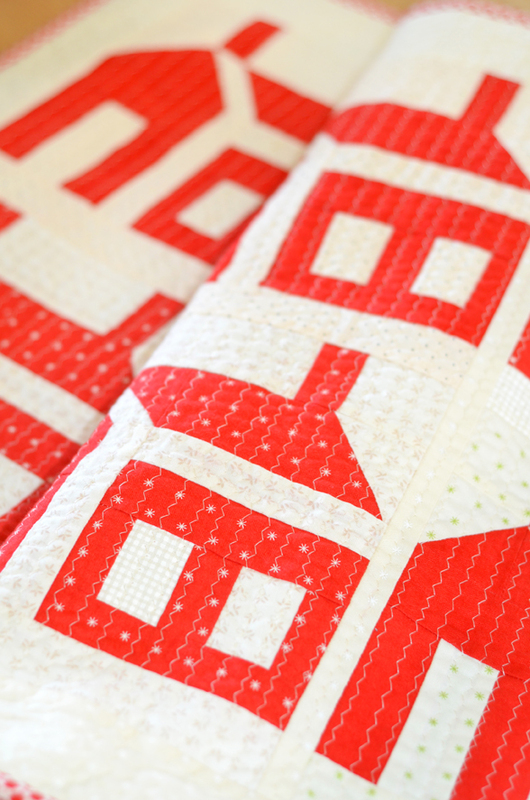 Is this house pattern in the Christmas Figs book?? This is my go to quilting method when I have a deadline and my Long Arm Quilter isn’t available to me. I love the texture it creates. when can we get th3e pattern? I love it!! This will be in a book that releases in May/June! Fantastic!! I love how this looks and will try it soon!! I bet it would look great on a lap quilt and give a super texture after washing! Thats not a stitchI have but it sounds like fun! oh my gosh that looks just adorable on there!! 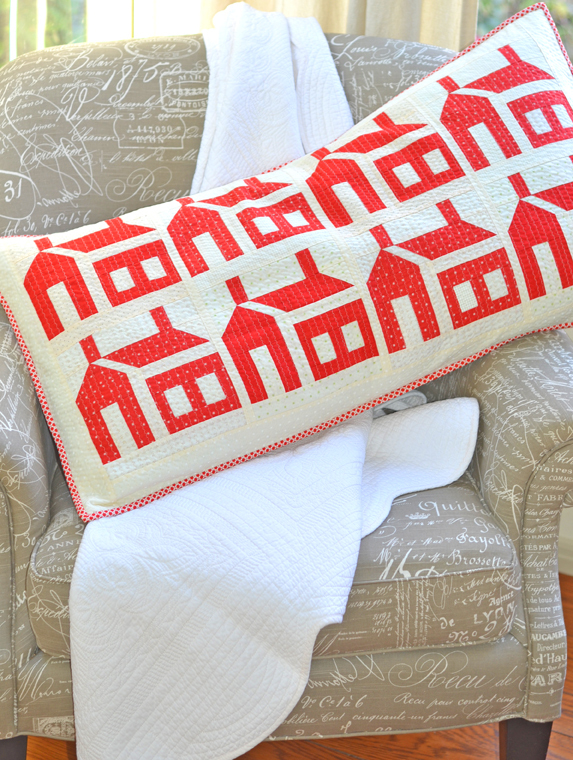 love the houses and the pillow!! so cute! Looks really good. Can you tell me how far apart you did the lines? Thanks!